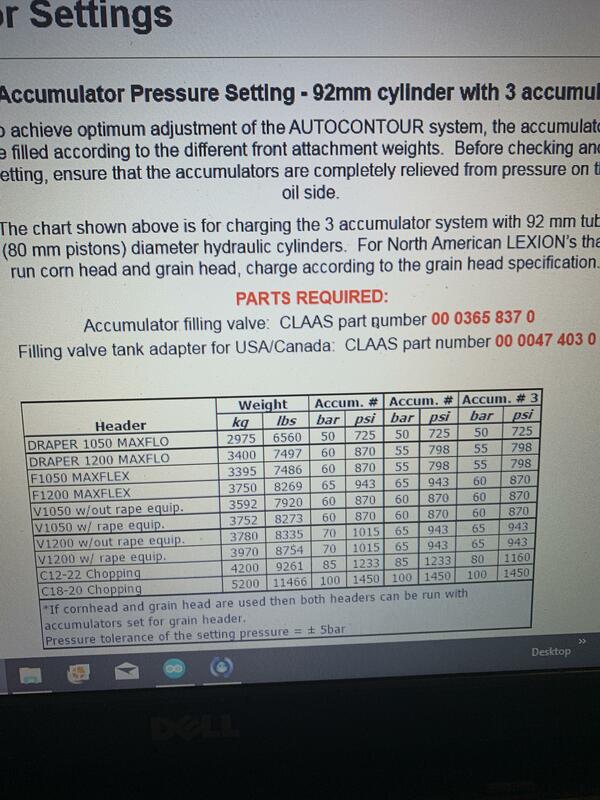 The Combine Forum > Harvesting Community > Claas / Lexion > Ever use ground pressure sensing for auto header height with a MacDon? When i change from Cereals to canola i only put the gaugewheels a hole lower .the rest i set with weight or tableangle. I NEVER touch springs on Adapter !! Sounds good, looking forward to another practise change. Thanks for asking question about contact weight SC, made me think of this thread. Only takes like another 10 months to try out lol. Well, only about 7 and 1/2 on average, mid August peas generally although August 8th at plus 35 this year. Hmm- interesting conversation. I'll need to comment on this one. The neat thing about the Claas is its really the only combine to "stack" the lift pressure and height sensors allowing you to run in a combined mode. That has both adcantages and disadvantages. One thing I discovered about lift pressure on a combine is its "bouncy"! Every time the raise valve opens there is a pressure spike---and vice versa. The accumulators absorb that spike and then the average pressure returns to the "right" reading....but if not properly filtered it can cause problems in a control circuit. (Yes I HAVE been able to get a head to HOP just based on lift pressure...#how engineers have fun!) As Don discovered--there are very small differences in pressure in the range you need to control in; sometimes a tenth of a volt can separate too low from too high. And BION, it actually depends on the geometry of the head angle as well. The same head 2" off the ground has a slightly different pressure than 24" off the ground. Remember that what you are trying to measure is how heavy the head is on the ground. On the other hand a linear mechanical sensor feeling the spring float essentially measures the same thing (how much pressure there is on the ground). It typically had much more range in the usable area (volts instead of tenths) and is not affected by the valves opening/closing. I find it to be much more responsive, repeatable and reliable than the pressure sensor. Essentially what you are doing when using pressure while running a MacDon is letting the springs take up the slack....the pressure is sorta holding you somewhere in the middle, while the springs are keeping your head from digging. I'd prefer to use a sensor that feels the spring motion--its more positive. That isn't to say that pressure can't be a very usable AHHC input. ANd those who are using it successfully, well thats what really matters right? Using pressure on a rigid head while running wheels on the ground, etc. is common. Just don't depend on pressure to run a rigid head on the ground...not a good plan. Haystack and aussie.ltd. like this. If the accumulators weren’t adjusted for the header weight during PDI, that “bouncy” can dang near shake you out of the seat. The neat thing about the Claas is its really the only combine to "stack" the lift pressure and height sensors allowing you to run in a combined mode. Claas may “stack” the readings on the display but not stack meaning reading both at the same time. Readings 50 to 100 are float optimizer sensors, either a single sensor normal or double sensors used to combine lateral feeder control for height. Readings 49 to 0 switches strictly to cylinder pressure sensing. That’s never set on machines that run both pickup and straight cut headers the weigh differences being so different. Cut height adjustment setting is used to set just below where that starts. yes forgot to mention Agwest set the accumulator to the MacDon. Looks like they just set it above the heaviest possible header and it’s lowered to suit. I do not know if any of my units were ever adjusted, I was never asked or told. I guess in an ideal world it would be nice to match to headers.